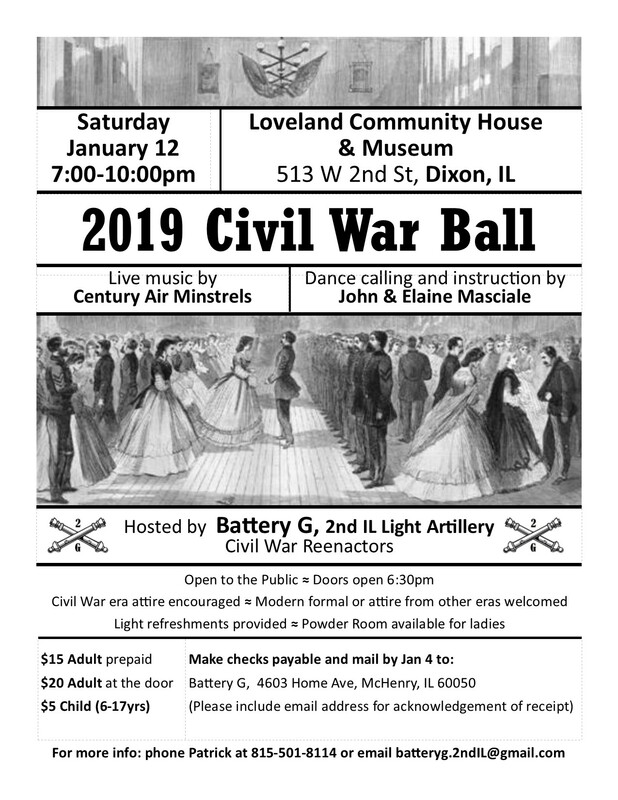 You are invited to attend our annual Civil War era Battery G Ball! Attendance is open to the public! Not limited to Civil War reenactors. Photographer Tom George Davison will be offering photo opportunities for guests to pose for formal or fun (or both!) photographs with their spouse, friends and family. Families with children are welcome. Come introduce your children to dancing and society within a fun, historical context. Period evening attire is encouraged but not necessary. Modern semi-formal attire or attire from other historical eras is also gladly welcomed. Doors open at 6:30pm. There will be a ladies powder room made available (across from the main floor ladies bathroom). Our goal and desire is to continue to provide a delightful, low-cost family event and Civil War era winter grand ball. With hall rental expenses rising, we relocated last year from Memorial Hall in Rockford to Loveland Community House in Dixon IL. Loveland Community House and Museum is a lovely hall that is dedicated to providing space for community social activities. The hall contains several rooms decorated in the Victorian era as well as a Victorian era museum. Online Reservation capabilities coming soon!! * Pre-paid reservations end Jan. 8 for online reservations. There is an online processing fee of $0.76 per adult ticket and $0.46 per child ticket. We would greatly appreciate if you would consider making pre-reservations instead of paying at the door. For more information, call 815-501-8114 or email Patrick at patrick.j.degeorge@gmail.com . Please consider sharing our event flyer with a friend! Invite a friend to join you to add an extra element of delight to your evening!